233 Commonwealth is located on the north side of Commonwealth, between Exeter and Fairfield, with 231 Commonwealth to the east and 235 Commonwealth to the west. 233 Commonwealth was designed by Rotch and Tilden, architects, and built in 1886-1887 by George G. Nichols, builder, one of two contiguous houses (231-233 Commonwealth) built for brothers: 231 Commonwealth for Jacob Crowninshield Rogers and 233 Commonwealth for William Crowninshield Rogers. Jacob Rogers is shown as the owner of 231 Commonwealth on the original building permit application, dated April 22, 1885, and William Rogers is shown as the owner of 233 Commonwealth on the original building permit application dated July 30, 1886. As originally built, 231 Commonwealth and 233 Commonwealth were of similar design, both with four stories and a basement, with brownstone façades at the basement and first story levels and red brick above. In 1937, 233 Commonwealth was remodeled to create a fifth story and replace the red brick façade with yellow brick. Jacob Rogers purchased the land for both houses, the 26.8 foot wide lot for 231 Commonwealth on March 13, 1884, from the Commonwealth of Massachusetts, and the 27 foot wide lot for 233 Commonwealth on January 18, 1886, from Frederick Sears Grand d’Hauteville. The land for 233 Commonwealth was part of a larger parcel on which 233-235-239 Commonwealth subsequently were built. It was originally purchased from the Boston Water Power Company on February 16, 1863, by Daniel Davies, Jarvis Dwight Braman, and Grenville Temple Winthrop Braman. Grenville Braman was treasurer of the Boston Water Power Company, Jarvis Braman was his brother (and later president of the company), and Daniel Davies, a housewright and master carpenter, was Grenville Braman’s father-in-law. The eastern line of this parcel was at the boundary between land originally owned by the Commonwealth of Massachusetts, to the east, and the Boston Water Power Company, to the west. There was 0.37 foot discrepancy in the original deeds, with the Commonwealth deed placing the boundary at 95.20 feet from the southeast corner of Fairfield and Commonwealth, and the Boston Water Power Company deeds placing it at 95.57 feet from the corner. The original 95.57 foot parcel sold by the Boston Water and Power Company to Daniel Davies and Grenville and Jarvis Braman was subdivided by subsequent buyers, and the 0.37 discrepancy was resolved to reduce the total land to 95.20 feet. Click here for an index to the deeds for 233 Commonwealth. By the 1887-1888 winter season, William Rogers had made 233 Commonwealth his home, and on February 1, 1888, he purchased the property from his brother. He previously had lived 205 Beacon. He was a widower, his wife, Mary Ingersoll (Bowditch) Rogers, having died in September of 1874 in Funchal on the Island of Madeira, following the birth of their son, William Bowditch Rogers. William Rogers had been a shipping merchant in the East India trade prior to the Civil War. In 1861, soon after the commencement of the war, he enlisted in the US Navy and served as an officer until July of 1866. After the war, he did not resume his shipping business. By the 1880s, he was a banker, probably in association with his brother, Jacob Rogers, who was Boston agent for J. S. Morgan & Co. of London. In early 1888, William C. Rogers and his son traveled to London. William Rogers died there in July of 1888. 233 Commonwealth was inherited by his son. He was still a minor and Jacob Rogers was named his guardian. 233 Commonwealth was not listed in the 1889 Blue Book. On May 20, 1889, 233 Commonwealth was purchased from Jacob Rogers, as William Bowditch Rogers’s guardian, by Charles Healy Ditson. He lived in New York City, where he was a music publisher. He married there in October of 1890 to Alice M. Tappin. 233 Commonwealth became the home of his mother, Catherine (Delano) Ditson, the widow of music store owner and music publisher Oliver Ditson. 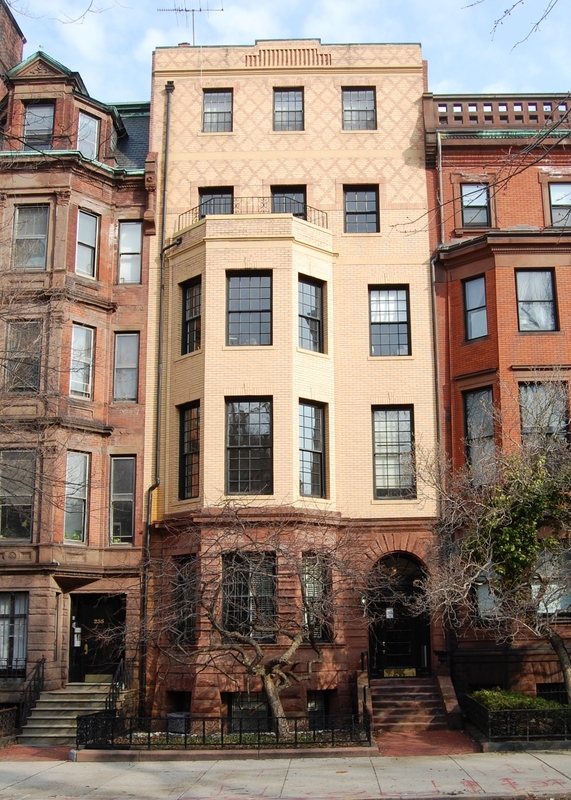 Prior to her husband’s death in December of 1888, they had lived at 8 East Brookline. Their daughter, Mary Frances (Ditson) Porter, the widow of lawyer Burr Porter, lived with her. Catherine Ditson continued to live at 233 Commonwealth until her death in August of 1899. After her death, it continued to be Mary Porter’s home. By the 1903-1904 winter season, Mary Porter had been joined there by Miss Laliah Burpee Pingree, who continued to live there until her death in October of 1906. Mary Porter died in March of 1921. On September 3, 1924, 233 Commonwealth was acquired from Charles H. Ditson by real estate dealer Henry C. Brookings, and on September 9, 1924, he conveyed it to Mary Lothrop (Webster) Butler, the wife of William Morgan Butler. 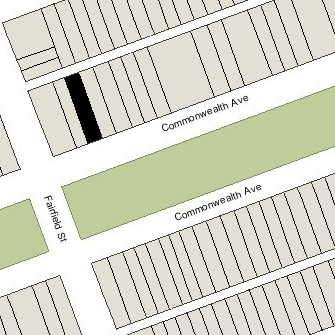 They lived at 231 Commonwealth and appear to have used 233 Commonwealth as an annex to their home (233 Commonwealth was no longer listed in the Blue Books after 1921). William Morgan Butler was a former lawyer and state legislator. He had retired from legal practice in 1912 and became a cotton manufacturer. In 1924, he served as Chairman of the Republican National Committee, and in November of that year, was appointed to the US Senate to fill the vacancy left by the death of Henry Cabot Lodge. He lost his bid for election to the office in 1926, and lost a second attempt for election to the US Senate in 1930. On March 31, 1931, 233 Commonwealth was acquired from Mary Butler by Edmund B. Snow, vice-president of the Ellis Title and Conveyancing Co. He lived in Allston. 233 Commonwealth was shown as vacant in the 1931-1933 City Directories. 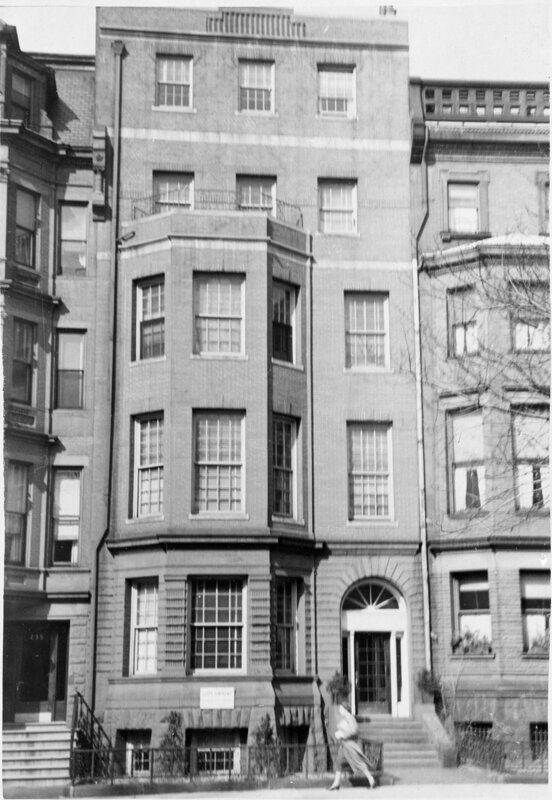 On December 28, 1933, the Massachusetts Hospital Life Insurance Company foreclosed on its mortgage to Henry C. Brookings, which had been assumed by Mary Butler and then by Edmund Snow, and took possession of 233 Commonwealth. The house continued to be shown as vacant in the 1934-1938 City Directories. On July 9, 1937, 233 Commonwealth was acquired by Sadie (Sarah) Elizabeth (Klayman) Green, the wife of Morris Green, of Dorchester. He was a contractor and she was treasurer of the Reliable Dress Shop in South Boston. That same month, she applied for (and subsequently received) permission to convert the property from a single-family dwelling into twelve apartments, including creating a fifth floor and rebuilding the brick portion of the front façade, using red brick. The remodeling was designed by architect Henry W. Gore, Jr., and constructed by Sadie Green’s husband, Morris Green, and Barnard Meshon, also a contractor. Plans for the remodeling — including elevations and floor plans — are included in the City of Boston Blueprints Collection in the Boston Public Library’s Arts Department (reference BIN R-2). As constructed, the façade was made of yellow brick and a complaint was filed by the Park Department. An agreement was reached that the brick would be painted red, with the joints between the bricks left natural or painted a dark grey in contrast with the brick. In June of 1938, the Park Department filed another letter of complaint, noting that the entire façade (bricks and joints) had been painted red, and not in the color of red that had been stipulated in the agreement. The work was subsequently redone and then, ca. 2007, the paint was removed and the yellow brick allowed to show. On December 30, 1938, Israel M. Levin foreclosed on a mortgage given by Sadie Green and sold 233 Commonwealth to James F. O’Brien, Jr.
On January 20, 1939, 233 Commonwealth was acquired from James O’Brien, Jr., by Sadie Green’s father, Myer Klayman (Clayman), and on June 29, 1939, it was acquired from him by the Park View Realty Corporation. Sadie Green’s step-son, William Green, was president and treasurer of Park View Realty (and also president of the Reliable Dress Shop). He was the son of Morris Green and his first wife, Minnie (Hirshhorn) Green. On July 18, 1959, 233 Commonwealth was acquired from Park View Realty by Lenk Properties, Inc. (Richard Van Siclen Lenk, president and treasurer). On November 24, 1975, 233 Commonwealth was purchased from Lenk Properties by Betty Bishop and Albert Kasarjian. On May 14, 1976, they converted the property into twelve condominium units, the 233 Commonwealth Avenue Condominium.